Category Archives: Who Will Roll Away This Stone For Me? Who will roll away this stone for me? Mark 16 :1-4 When the Sabbath was over, Mary Magdalene, Mary – the mother of James, and Salome brought spices to go to anoint Jesus’ body. 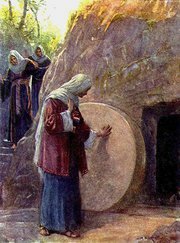 Very early, on the first day of the week, just after sunrise, they were on their way to the tomb and they asked each other, “Who will roll the stone away from the entrance of the tomb?” But when they looked up, they saw that the stone, which was very large, had already been rolled away. The love of Christ was so much filled in their heart, that they did not even fear to go to the tomb while it was still dark. They had pain, but the Love of Christ compelled them to move forward. All love will fail one day, but the love of Christ keeps you going. They did not fear the dark because perfect love casts out fear. When the love of Christ is perfect in you, fear will flee. Why is the fear of tomorrow there in you ? Why do you fear men and darkness ? It’s becoz the Love of Christ is not perfected in you. While they were going ahead to the tomb, they asked themselves ” Who will roll away the stone for us?”May be this is your question today, who will roll away this stone for me? Are you discouraged and feel that you have come to the end of the rope of your life? 1) A large stone to roll away and 2) a Roman seal to be broken. Rolling away the stone is not that hard, but breaking the Roman seal was not easy. Who had sealed this stone? It was not an ordinary person, but the king of that nation. No one could break that seal other than the king himself. This was the concern of those women who loved Christ. They had a huge stone ahead and a powerful seal to break . So, they asked themselves, “ who will help us?” But I was encouraged that these women did not go back. They marched towards the stone. This is the step of faith. Even though they knew that they were weak to roll away the stone, and powerless to break the king’s seal, they did not give importance to the reality of what was important. Do not give importance to what is in front of you, but give importance to Him who is in front of you. We walk by faith and not by sight. If we walk by sight, we will stumble and fall, but when we walk by faith, moutains will be grounded. Faith does not deny the fact but it does not allow the fact to overcome you. You may be going through pain which is a fact, but faith in God will never allow that fact to overcome you..This is simple truth and many among us are unaware of this. First of all , the love of Christ compelled this women and secondly, the faith in God made them strong to march forward the huge stone. Verses 4 says that ” But when they looked up, they saw that the stone, which was very large, had been rolled away….Here is the secret to roll away the Large stone of your life…. Look Up !! Do not look around . When they looked up, they saw that the stone , which was very large had been rolled away. You will not get any answer when you look around ( your best friend, your loved ones etc ) .My beloved, the thing which you find difficult to answer, heaven has the answer for it. Jesus Christ is the answer for your every question. King of Kings broke the seal of Roman govt and Lord of Lords rolled away the stone. If heaven has rolled away the large stone and broke the seal of the powerful govt for those women…let the love of Christ Jesus fill your hearts,Walk by faith, look up and see the answer of God!! STONE IS ROLLED AWAY, SEAL IS BROKEN !! Leave a comment	| posted in Who Will Roll Away This Stone For Me?